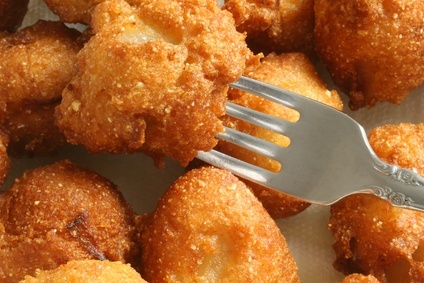 My recipes for hush puppies include many different ideas you may use to create a different flavored hush puppy that goes with fish, pork, or chicken. I also include a homemade Jiffy cornbread mix recipe at the end of the page, so there is no need to go to the store to buy a box when you can make it from home. These beauties are crispy on the outside and fluffy on the inside. A real treat. Mix the first six ingredients together. Add the sweet and green onion. Mix the egg yolk and the buttermilk together and add to the mixture. 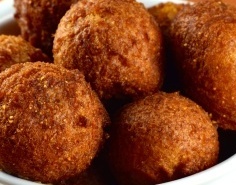 Heat enough oil in a pan to cover teaspoon-full sized hush puppy mixture. Whip the egg whites until it forms stiff peaks and fold into the mixture. Drop batter into hot oil and fry until golden brown. Drain on paper towel or a paper bag. Mix the flour, cornmeal, sugar, baking powder and salt together in a medium bowl. Whisk in the melted butter and mix until dry mixture is smooth and lump free. If a recipe is calling for a box of Jiffy cornbread mix, add the above mixed ingredients to the recipe. 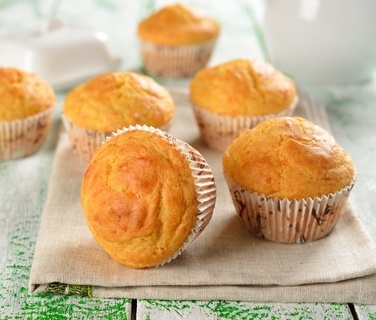 To make corn muffins, preheat the oven to 400 degrees. Spray the muffin tin and fill half full with batter. Bake 15 to 20 minutes. Makes 6 muffins.